Today we saw the Man Ray & Lee Miller exhibit at the Legion of Honor. I loved it, very intriguing. The two were artists and lovers, with the exhibit depicting their career, relationship, and friendship that spanned their lifetimes. Man Ray was an all-around creative artist (painter, illustrator, film-maker). Lee Miller was a celebrated model who honed her craft in photography to become a war correspondent for Vogue. Their romantic relationship lasted a few years, during which they collaborated together and inspired one another. Their world revolved around art and other creative types. One section of the exhibit shows the work of their friends, including the sculptor Alexander Calder who, during one of Man Ray’s dinner parties, fashioned a weight lifter from the wire of a champagne cork and added red dumb bells using the wax. Very impressive. Man Ray was devastated when Lee left him. 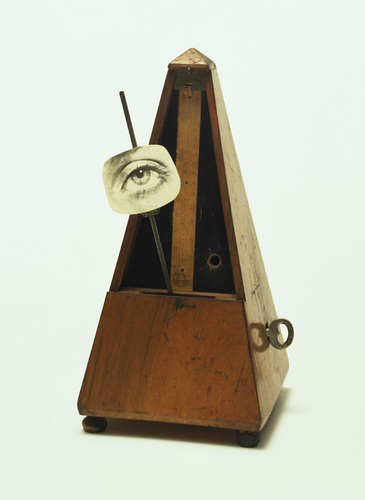 One of his most famous pieces is a picture of Lee’s eye that he attached to a metronome. He called the work Object to be Destroyed. What’s really touching is Man Ray reaching out to Lee to offer his friendship after she returned from the war with chronic depression. The exhibit ends with a picture of the two of them, old and smiling, at an art event.